Internationally Certified Health Coach, Kim Weiler is devoted to helping others who struggle with skin conditions. Studio Carry On Harry had Kim Weiler as guest in the studio. She is more known as someone associated with glamour world but very few know that she had a long battle to live out fighting auto-immune skin disease called Psoriasis. She shares her journey on the show with Singapore Talk Show host Harry Johal. Her new book "Ps – It’s All About Love" on Amazon also became topic of discussion.Today she is know as Internationally Certified Health Coach and helping out many with her knowledge about the topic of skin diseases. 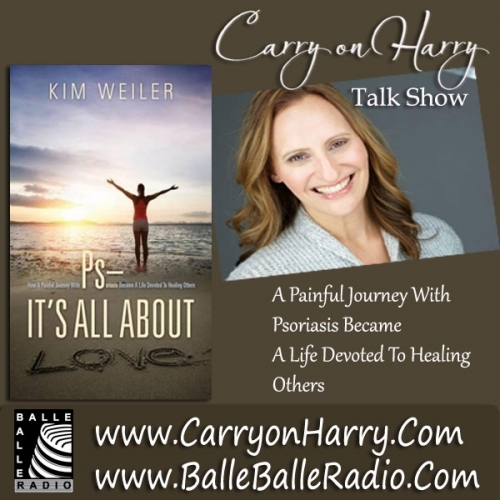 Kim Weiler’s 21-year journey to healing began when she developed the autoimmune disease psoriasis at the age of 19. After a long career working in all facets of the TV and film industries (see www.imdb.me/kimweiler) and living with the fear that her psoriasis would negatively impact her work as an actress, she is now helping others through her business Healing My Skin, LLC. Kim holds a bachelor’s degree from Marymount Manhattan College, is a graduate of the esteemed Institute for Integrative Nutrition (IIN) and a is member of the International Association of Health Coaches (IAHC). As an Internationally Certified Health Coach, Kim is devoted to helping others who struggle with skin conditions. She has learned from experience that feeling good about ourselves, with all of our human imperfections, is key to living a fulfilling life. Stay tunned for talks with the guest.